The Flow Treemap window displays the contents of the Flow Monitor table as a treemap. The tiles on the treemap are coloured according to the network protocol used by the underlying flow. The area occupied by each tile is proportional to the value of the selected property for the flow. The flows are sorted by the selected property, the largest value appearing at the bottom left corner of the treemap and the smallest at the top right. This ordering is consistent in 4 of the treemap algorithms implemented in WhatRoute. The Pivot algorithm, however, gives a more random layout with smaller values propogating to the top and right edges of the treemap. The choice of layout algorithm to use is up to you. The default Aspect algorithm is my preference because it is well ordered, has good tile aspect ratios and is a much simpler (i.e. lower overhead) implementation than either of the Squarify and Pivot algorithms. Also, I invented it (kind of). The treemap is updated each time the Flow Monitor updates its table. Any flows that have been filtered out by Flow Monitor will not be shown on the treemap. The window image below shows a treemap displaying packet rates. 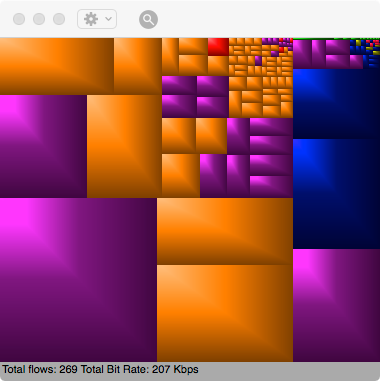 Flow Detail can be inspected by clicking on the tiles that make up the treemap. The first click on a tile, will highlight that tile and remove any highlighting from a previously selected tile. If the popover window was previously detached, it is updated with the details of the new selection. If you again click the (now highlighted) tile, and the popover had not been previously detached, you will see a new popover (which can be detached) showing the flow details. To close the popover, just click anywhere outside the popover window. The property menu selects the flow property to be displayed by the treemap. There are currently 5 algorithms implemented for laying out the treemap. Simple - The original treemap layout algorithm devised by Ben Shneiderman. Clicking the Zoom Control in the toolbar will display a slider. * Moving this slider to the left will zoom out the display, each tick mark quadrupling the number of low order values that have been discarded from the treemap. * Moving the slider to the right zooms in on low order values by discarding the higher orders. * In the central position, no zooming is performed and WhatRoute will display all the flows that have not been filtered. The treemap colours the tiles according to the protocol/port colours defined in the Map Window Settings panel. If the Map Window is not open, then the fallback is to use the following colours.